ProcedurePlace DT-46620-3 which is part ofDT-46620seal installerover the case hub and adjust it so that only the bottomseal ring is exposed.Place a NEW fluid seal ring ontoDT-46620-3 which is part ofDT-46620seal installer.Use DT-46620-2 which is part ofDT-46620seal installerto push the fluid seal ring down overDT-46620-3 which is part ofDT-46620seal installerinto the hub ring groove.Repeat the above steps to install all 3-sealrings, adjusting DT-46620-3 which is part ofDT-46620seal installerto the appropriate ring groove. Install DT-46620-1 which is part ofDT-46620seal installerwith the large chamfer end down over the fluid seal ringsand leave DT-46620-1 which is part ofDT-46620seal installeron the seals for at least 60 seconds. ProcedureInstall DT-46620-1 which is part ofDT-46620seal installerwith the small chamfer end facing down for at least 60seconds. 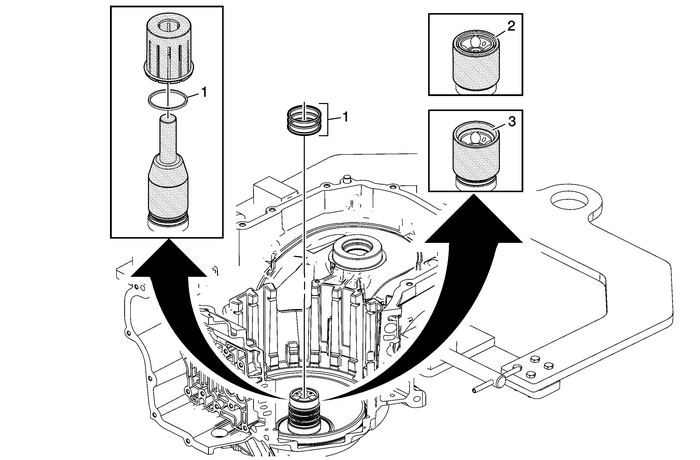 This will properly size the bottom seal ring.Leaving DT-46620-1 which is part ofDT-46620seal installeron the fluid seal rings for an extended period of timecould cause a fluid leak on the initial clutch piston circuit untilthe seal rings warm up and expand to the proper dimension.